IIFT 2019 entrance exam for MBA (IB) admission 2020 will be held on December 1, 2019. IIFT will conduct its own MBA (IB) 2020-22 entrance test This year IIFT Exam Pattern will consists of 6 sections with questions on English Grammar; Vocabulary and Comprehension; General Knowledge & Current Affairs; Logical Reasoning; Data Interpretation; and Quantitative Analysis. IIFT 2019 admission test remains a multiple choice objective type written test (in English) of 120 minutes. IIFT 2018 exam is over on December 2, 2018. The IIFT 2018 exam for admission to IIFT 2019 MBA (IB) was of 2 hours duration and was held in single session as a paper based test. 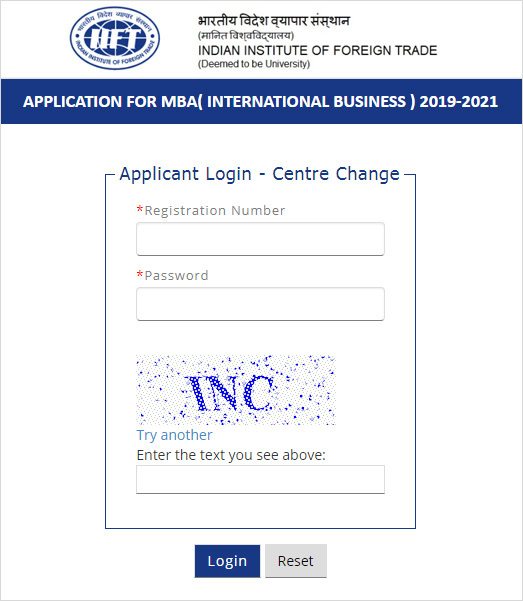 IIFT conducted its own MBA (IB) 2019-21 entrance test This year IIFT Exam Pattern for admission to MBA (IB) 2019-21 batch was expected to have 6 sections consisting of questions on English Grammar; Vocabulary and Comprehension; General Knowledge & Current Affairs; Logical Reasoning; Data Interpretation; and Quantitative Analysis. IIFT 2018 admission test has remained a multiple choice objective type written test (in English) of 120 minutes. Indian Institute of Foreign Trade (IIFT) had opened the Application Details Edit facility for the IIFT 2018 Exam and allowed the candidates to amend and modify the details in their IIFT 2018 exam registration and application form. Error correction in IIFT application form was a one time option to modify the data. Modification option is available for those who have completed all four stages of application form - Primary registration, Academic and Personal details, Payment and Photo/Sign upload. No change in Resident status, Mobile No., E-mail, Category, WrittenTest & GD Centre cannot be done now. IIFT has now closed the error correction process before the exam. You could edit limited details in your IIFT 2018 application form by entering your IIFT registration number and password, Please note that Resident, Mobile No., E-mail, Category and WrittenTest & GD Centre cannot be modified by the candidate. IIFT has closed the facility to submit request for IIFT 2018 exam Test Centre Change on November 5. Application fee was Rs.1000/- to submit the request for Change of Centre. The Request could be submitted online only. No requests in this regard has been entertained offline. IIFT 2018 registration and application last date had ended on September 24, 2018 after an extension of 10 days. The IIFT 2018 Exam Fee to appear in the IIFT entrance test on December 2, for IIFT 2019 Admissions is Rs.1650/-. (Unless the IIFT Fee is increased further this year.) The IIFT 2019 exam fee includes the IIFT Registration Fee, IIFT Application Fee and IIFT 2018 Exam Fee. The IIFT exam fee also includes the participation and registration fee for GD-PI-WAT process, after the result declaration of IIFT 2018 entrance exam for MBA (IB) 2019-21 programme. More than 60,000 candidates are expected to register and apply for IIFT 2018 exam as happens every year. Last year there were 62,000 candidates who had registered to appear in IIFT exam and out of them 55000 candidates appeared on the IIFT Exam date. With the growing popularity, unique learning process and high placement prospects of MBA (IB) at IIFT, it is expected that with the launch of new campus, IIFT 2019 MBA (IB) Admission Test on December 2, 2018 will again have more than 60,000 registrations. None of the IIFT 2019 MBA aspirants should have any confusion in regard to whether the IIFT MBA (IB) Admission test on December 2, 2018 should be referred to as the IIFT 2018 Exam date or IIFT 2019 Exam date. In fact, IIFT 2018 Notification contains all the IIFT 2018 exam dates and the IIFT exam schedule which is meant for admission to IIFT 2019 MBA admission. Accordingly, while the IIFT Exam Notification has the IIFT 2018 Exam dates, in fact these are IIFT 2019 Exam dates for IIFT 2019 MBA (IB) Admission. Indian Institute of Foreign Trade (IIFT) is one of the highly ranked dream B- schools in India. IIFT has been positioned at 23rd rank among top MBA colleges in India in MHRD Government of India NIRF Ranking 2018. After launching its one more campus at Kakinada in Andhra Pradesh, now IIFT offers MBA (International Business) at its 4 campuses in India and abroad namely New Delhi, Kolkata and Kakinada campuses in India and at Dar-es-Salaam campus in Tanzania. IIFT 2018 is the gateway to MBA (IB) 2019-21 at IIFT. It is considered as one of the best 2 years MBA programme in International Business. Success in IIFT 2018 entrance exam with around 45 to 50 marks out of 100 marks, may lead to admission to the institute’s highly reputed 2 years full time MBA 2019-21 International Business programme at its Delhi, Kolkata or newly launched Kakinada campus. IIFT offers great learning experience with high placement to its students. The IIFT 2019 MBA (IB) admission test score will be accepted only by IIFT for admission to its campuses and no other MBA college accepts IIFT exam score. With effect from the entrance exam held on December 3, 2017, IIFT now conducts the entrance exam on the first Sunday of December, in paper-pen mode across the country instead of 4th Sunday of November. IIFT Entrance Exam Application form for IIFT 2019 MBA admission Test to be held on December 2, 2018 is available WEF August 6, 2018. The earlier practice of IIFT application in offline mode has been discontinued and candidates should apply online only. To apply for IIFT 2018 entrance exam for MBA(IB) 2019-21, you must visit IIFT website to fill in the online form as per details given in website. The cost of Prospectus and Application Form is Rs.1,650/-. IIFT will conduct the MBA entrance exam in paper-pen mode across the country on December 2, 2018 in 20 test cities in India. With a print out of the Admit card, the candidates should reach the venue of the Exam Centre on December 2, 2018 latest by 9.00 a.m.
(a) Passport (b) Election I-Card (c) Aadhar Card (d) PAN Card (e) Driving License (f) College I-Card for appearing in the Exam. The process to opt for change of IIFT exam centre for 2018 exam will be closed in the last week of October or the first week of November 2018. Candidates should be careful while opting for the Admission Test Centre. A fee of Rs.1000/- would be charged for changing the opted Centre. IIFT doesn’t accept any other score than the score of its own entrance test for domestic candidates. For NRIs and foreign nationals GMAT scores are accepted. IIFT 2018 exam registration process for MBA (IB) 2019 admission closed on September 24, 2018. IIFT 2018 Exam Registration and Application last date was extended to September 24, 2018 from earlier September 14, 2018. Indian Institute of Foreign Trade (IIFT) had received requests from many flood affected parts of the country especially Kerala, Bihar, Assam, Uttar Pradesh and other areas to extend the last date of registration. Acceding to these requests, the last date for IIFT 2018 exam was extended by 10 days to September 24. IIFT Eligibility Criteria 2018 has been released alongwith the IIFT Exam Notification on August 6, 2018. IIFT MBA entrance exam is scheduled on December 2, 2018 as paper based test. One of the key changes introduced in IIFT 2018 Exam Eligibility is the application of minimum cut offs in bachelors’ degree. IIFT 2018 Exam Application fee has been increased to Rs.1650/-. IIFT exam pattern 2018 is expected to remain same as that of last year. IIFT Paper pattern is based on paper-pen based objective type exam pattern. Over the years, IIFT exam pattern has remained paper pen based. Accordingly, IIFT 2018 paper pattern will also be conducted in paper pen mode and will be of 2 hours duration from 10.00 A.M. to 12.00 Noon. IIFT paper pattern 2018 will be of a single session and the exam will be held in 20 test cities across India on December 2, 2018. IIFT Admit Card 2018 is live for download on IIFT official website from November 16 to December 2, 2018. The Admit card is your passport to the IIFT 2018 exam leading to admission in one of the three campuses of IIFT in India. 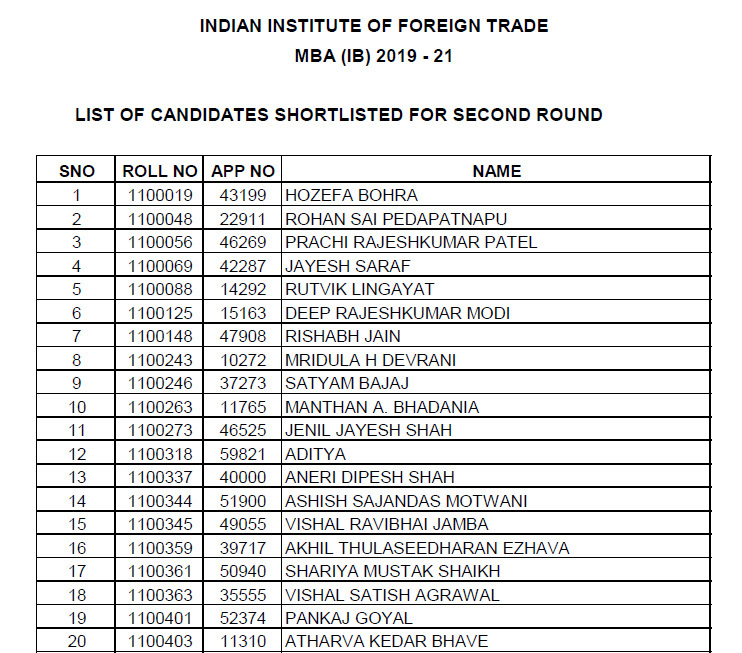 Indian Institute of Foreign Trade has also sent the IIFT 2018 Admit card by post also. However, in case of the loss of admit card in transit, IIFT does not take its responsibility. Therefore, it is better to login on IIFT official website and download your exam admit card. You can download IIFT admit card in simple steps. IIFT Application form last date for IIFT 2019 admission closed on September 24, 2018. 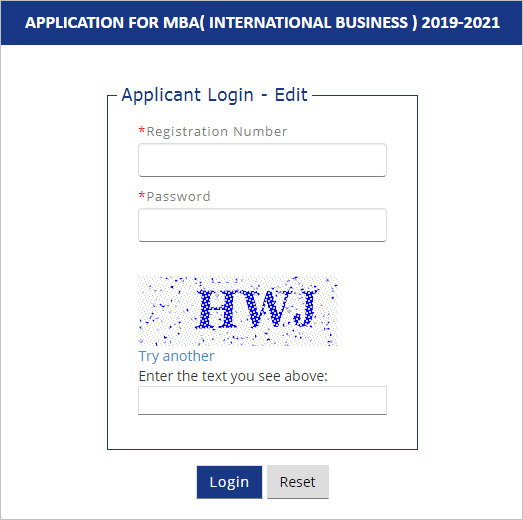 IIFT Application form had to be submitted online only for admission to IIFT MBA (IB) 2019 -21 programme. IIFT 2018 exam Application fee is Rs.1650/- for General Candidates and was to be paid online. 10 more days were made available for the candidate to submit their IIFT application form. IIFT MBA (IB) admission Test is scheduled on December 2, 2018 as paper based exam. IIFT 2018 exam Syllabus consists of multiple choice objective type questions (in English). Although there is no specifically defined IIFT Exam Syllabus, but going by the previous trend of IIFT questions, the IIFT 2018 Syllabus & exam pattern comprises the questions on English verbal Ability, Reading Comprehension, General Knowledge & Awareness, Logical Reasoning, Data Interpretation and Quantitative Analysis. IIFT 2018 exam has got over at 12 Noon on December 2, 2018 as a paper based test. Candidates found the IIFT exam at higher difficulty level than last year. The expected cut offs for shortlisting by IIFT may go down to 34-36 marks out of the 100 total marks. IIFT Percentile predictor will be live on December 2, 2018 at 12 Noon after the IIFT exam is over. It will guide you to assess your performance in IIFT 2018 exam and whether you will be able to score the expected percentile for shortlisting. 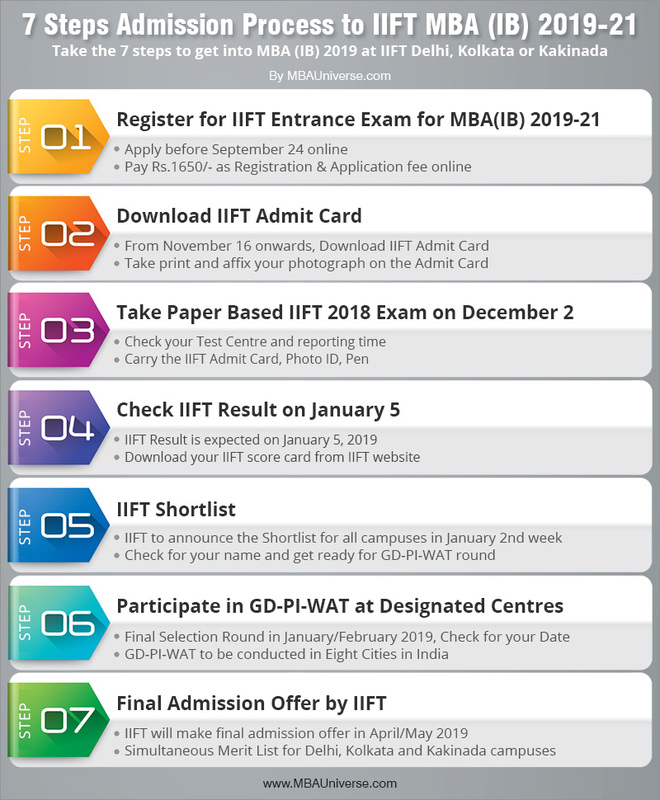 You will be anxious to know your IIFT 2018 exam percentile score and the process how to arrive at the accurate IIFT percentile calculation, after taking your exam on December 2, 2018 to know your MBA (IB) 2019 admission chances in preferred IIFT campuses located at Delhi, Kolkata and Kakinada. IIFT Preparation for IIFT 2018 exam, to be held on December 2, 2018, with an aim to get admission in prestigious MBA (IB) 2019-21 programme at one of the three IIFT campuses located in Delhi, Kolkata and Kakinada must be started well in advance as per the revised IIFT exam pattern. In view of the experts and past IIFT toppers, the IIFT Exam preparation must be well defined and one of the important points which differentiates IIFT exam preparation from other exams is the GK for IIFT exam and how to prepare for it. IIFT 2018 exam answer keys are available for download now. Although IIFT has not yet officially released the answer keys to the question paper sets for IIFT 2018 exam held on December 2, 2018, the IIFT exam answer keys have been released by top preparation institutes like Bulls Eye, IMS, T.I.M.E., CL among others. The answer keys were released a few hours after the IIFT exam was over at 12 Noon on Dec 2. Accordingly the IIFT 2018 answer keys can be accessed for the respective question set.